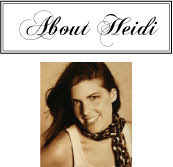 This color palette is for one of our readers, Courtney. Courtney is getting married at a farm in October, and wasn't sure how to incorporate a "happy vintage feeling" into her wedding with her chosen color scheme, blush and red. To be honest, I had a bit of a tricky time trying to convey pictorially the feeling I wanted to evoke. I just couldn't seem to find the pictures I was looking for, so I will attempt to explain what I envisioned for this event with the help of the color palette below. 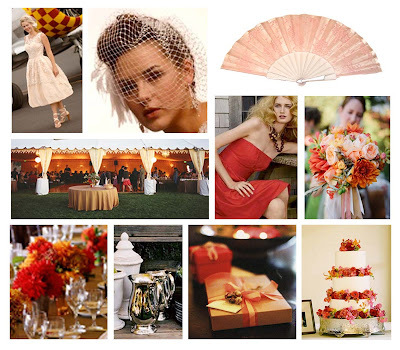 I've added some fall colors such as dark orange and golden yellow to give the wedding an autumny feel. I can see the bridesmaids in red dresses, as Courtney had already chosen, with the bouquet pictured middle right. 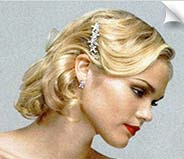 Their hair can be done in a 1920's style do (pictured below via Bride's Head Revisited), or they can wear vintage style shoes to help evoke the vintage theme. Courtney's dress is blush and is similar to Stephanie James style dresses. I can see her with a bouquet similar to the colors in the arrangement pictured bottom left and wearing a veil similar to the one below by Stephanie James Couture. She can even wear cute red shoes to bring her favorite color into the outfit. For the reception I picture light brown, or khaki colored table cloths with antique silver pitchers serving as vases for the flower arrangement pictured bottom left. Possibly a few candles to add a romantic vintage feel. Another option for centerpieces would be vintage tins in place of the silver pitchers. This would be a little more casual. Vintage post cards could serve as the table numbers only instead of the table having a number, it could correspond with what is on the postcard. For instance if it is a vintage postcard from Santa Barbara, California, the table "number" would be Santa Barbara, CA. Another fun way to incorporate the vintage theme would be to set up an ice cream bar, similar to the ones that were popular in the 40's and 50's. 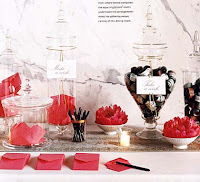 I'm not sure if this has ever been done at a wedding, and for an October wedding it might be a little chilly so instead a candy bar could be set up, such as the one pictured below from Rebecca Thuss. The candy could be displayed in apothecary jars to give it an old fashion feel. 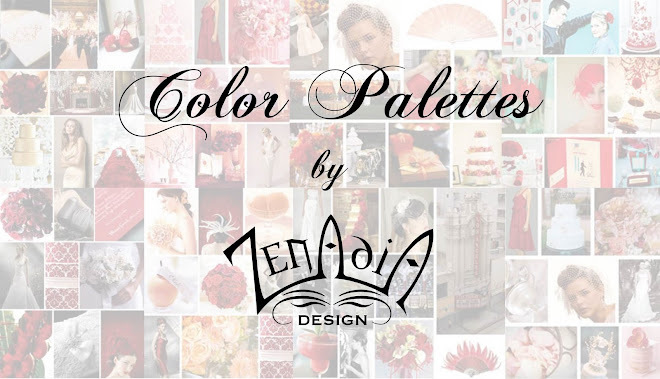 I hope this color palette and my suggestions can help Courtney create the wedding of her dreams. bottom row: Ariella Chezar via The Bride's Cafe, Oh How Charming, Santa Barbara Magazine Feb/March 2008, Modern Day Design.